Enjoy an entertaining evening for a great cause benefiting The Well Outreach, the area's local food pantry charity. 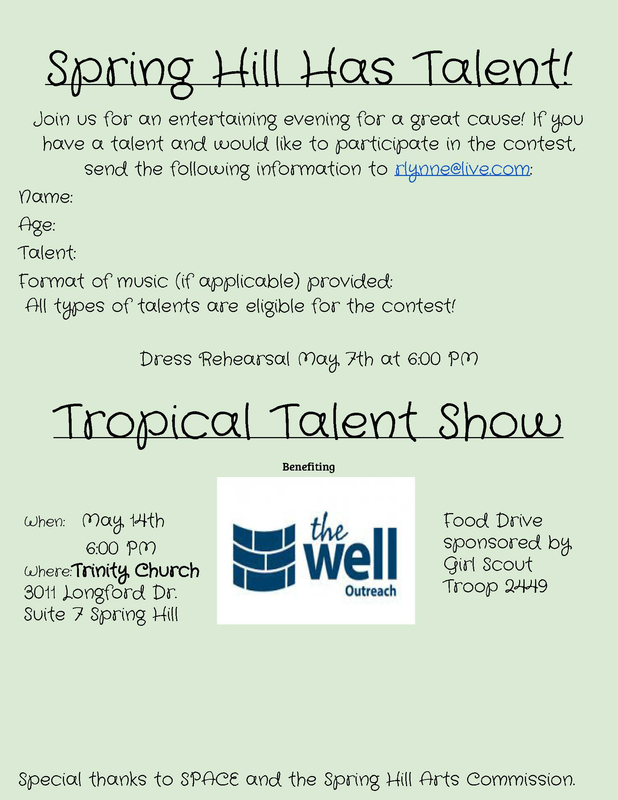 The 'Tropical Talent Show' will be hosted by Girl Scout Troop 2449 and SPACE at Trinity Church, 3011 Longford Drive, Suite 7, in Spring Hill. If you have talent and would like to participate in the contest, send the following information to Ricky Lynne at rlynne@live.com: Name, age, talent, and format of music (if applicable) provided. All types of talent are eligible for the contest. Dress rehearsals will be at 6 p.m. May 7. This food drive event, benefiting The Well, will be sponsored by Girl Scout Troop 2449. Special thanks to SPACE and the Spring Hill Arts Commission.